The Centennial celebrations will culminate with a Centennial Re-Dedication Service for the Sanctuary on Dec. 16, 2018 which will also be Bow Tie Sunday and will be in coordination with Kathy Jones’ plans for a special Music Sunday. A little over 100 yrs. ago, on June 10, 1917 there was a big party here at Huguenot! After much planning, design and fund raising – the corner stone for the New Sanctuary was laid in place – set with the Trowel that is in the display case in the Library entry. This was the beginning of an 18-month building campaign that culminated with the dedication of the Sanctuary on Dec 8, 1918. Huguenot had a new home, World War I had just ended, this was, as they say a…. momentous occasion! When you think of 100 years of life here a Huguenot -what comes to your mind – is it what was happening in the world in 1917? What was life like in Pelham when the Huguenot congregation decided to repurpose the original Little Red Church, built in 1876, and construct our fine, solid stone sanctuary. 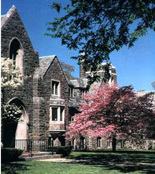 The first portion built of what we now refer to as Huguenot Church began as only what is referred to as the Sunday School Wing – which we now call the Chapel and included the Sanctuary, Friendship Room ( Chapel), several basement classrooms, the Vestry, and separate Men’s and Women’s Lounges – the latter with a balcony and outdoor terrace! Nearly all of the original Sanctuary windows were clear glass at that time – the wonderful stained-glass windows that we all now enjoy were added over the next 35 years, mostly in honor or in memory of members of these earlier congregations. Originally there was a Tiffany window where the current Vestry Door stands – this window now adorns the Witherbee Room. A new Odell organ was installed and to pay for all of this a mortgage for $100,000 from the Bank of New Rochelle was taken out and repaid over the next 30 years. The Sunday school wing opened on June 9, 1918, the Sanctuary was completed that fall and dedicated on Dec 8, 1918. To celebrate and honor the first 100 years of the HMC Sanctuary Wing for which construction started in June 1917 and began serving HMC upon its dedication in Dec. 1918, the Centennial Planning Committee was formed in the spring of 2017.